The Congress is pleased to advise the Early Bird rates have been extended to the 20 June for unsuccessful Geohost applicants as well as Oral and Poster accepted abstract presenters. Please book and pay before this date to qualify for this discount. 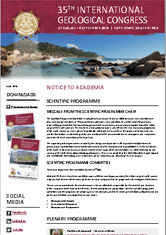 All presenters must be registered and paid by 20 June in order to be included in the Congress programme. Register online and make payment via a credit card, or EFT/Swift transfer after requesting an invoice. To book your stand representative, please log into your Exhibition profile and use the discount code indicated under the "Existing booking" tab. Please contact the registration team for any technical queries.